An English Inscription by Shimazu Tadashige, 1908. Shimazu Tadashige’s English inscription – a translation of the original memorial. “On the fifteenth day of the eighth month of the second year of Keicho (1597) at Nangen in Zenrado there were slain many thousands of the Ming soldier four hundred and twenty falling by the hands of the men of Satsuma and on the first day of the tenth month of the ensuing year the Ming forces were smiten at Shisen in Keishodo with a loss of upwards of eight thousand men. On these battlefields over three thousand Japanese soldiers perished by arrow and by sword and who shall tell the number of those who succumbed to accident or disease and land and sea. To the end therefore, that those who fell in the Corean War foe and friend a like may be gathered everyone into the way which leads to Buddhahood. This monument has been erected in the first days of the sixth month of the fourth year of Keicho 1599 by Fujiwara Ason Shimadzu Yoshihiro Hyogo no Kami Prince of Satsuma and Shosho Tadatsune his son. 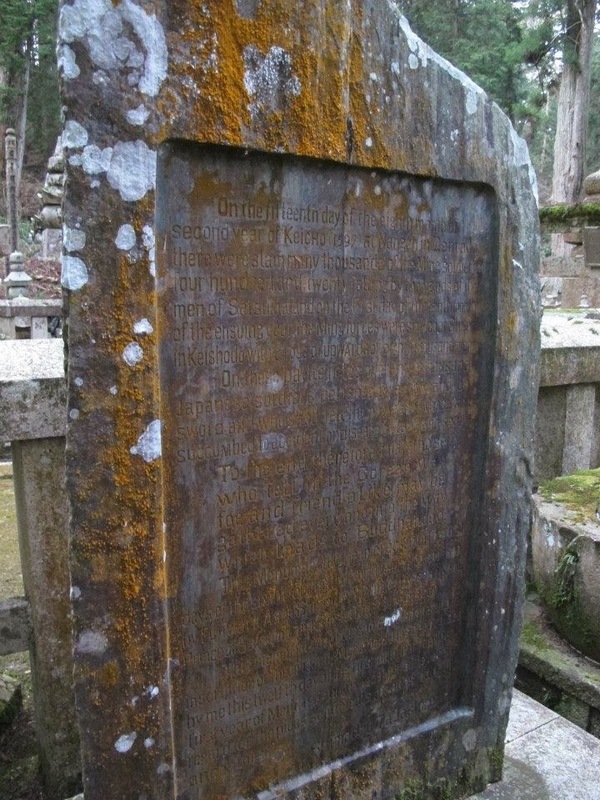 This monument recording in English the above inscription of the original monument has been raised forty first year of Meiji 12 January 1908 out of reverent regard of the pious sentiments manifested by ancestors. Shimazu Tadashige (born 1886) was head of the Shimazu family and a descendent of the general mentioned above, Shimazu Yoshihiro. His father, Shimazu Tadayoshi, was the 12th, and final, feudal lord of Satsuma. He graduated from the prestigious Imperial Japanese Naval Academy in 1907 and would go on to study in England in the 1920s. The Shimazu family controlled Satsuma province for almost four centuries until the dissolution of the daimyo. They were classed as tozama – outside the hereditary vassals of Japan’s ruling Tokugawa clan. During the Bakamatsu era, they were instrumental in bringing about the end of the Tokugawa Shogunate. The Shimazu clan were historically associated with foreign interaction. Their position, at the southern tip of Kyushu, gave them access to foreign trade and a knowledge of the outside world that other clans did not enjoy. As well as playing an important role in the invasion of Korea they gained control of the Ryuku islands in the early 17th century. In the 19th century, international exchanges were revived due to the forced opening of Japan by Western powers. After the bombardment of Kagoshima (1863), the Shimazu family developed ties with the British and they became allies in the Boshin War (1868-1869) which culminated in the Meiji Restoration. This monument recognizes one of the most famous foreign ‘interactions’ in the family’s long history – the final offensive of a seven year war with Korea. Ming Chinese forces had repelled the Japanese invasion, which began in 1592, and a stalemate ensued. Naval defeats cut off the supply chain, further hindering Japanese progress. More than half of the Japanese forces were withdrawn leaving just 60,000, mostly soldiers from Satsuma, commanded by Shimazu Yoshihiro and his son. In 1597, Shimazu Yoshihiro and his men assisted in the capture of the city of Namwon (‘Nangen’), where thousands of Korean soldiers, women and children were killed following collusion between Chinese and Japanese forces. These losses are recorded on the memorial at Okunoin. Shimazu Yoshihiro’s most remarkable victory was the battle of Sacheon (referred to as ‘Shisen’ in the inscription). The Japanese-style fortification at Sacheon (constructed on the site of a former Korean stronghold) was held under siege by Ming and Korean forces. The men of Satsuma were significantly outnumbered. A large artillery explosion caused a fire in the ranks of the Ming forces, panic ensued. This opportunity was seized upon by the defenders who sallied forth. Heavy casualties were sustained by both sides (although those listed on the memorial appear to be considerably lower, and more accurate, than other contemporary estimates – including the chronicles of the Shimazu family). Despite the initial international allusions, this is not a typical war memorial recording a victory for national posterity. The conflict is framed by the Satsuma clan and the leadership of the Shimazu family. This memorial stands alongside the Shimazu’s family crypt at Koya-san and was erected in 1599, just a year before the battle of Sekigahara, which unified Japan and led to the formation of the Tokugawa Shogunate which ruled until the Meiji Restoration. The consideration shown for the fallen, on both sides, reflects the sacred surroundings of Kobo Daishi’s mausoleum and the watching ancestral spirits. The English inscription was written during the Meiji period at a time when the Satsuma clan held powerful positions within the new elite. This inscription, rare for its time, made the memorial comprehensible to the few English-speakers who happened across it, on a sacred but extremely remote mountain, at the turn of the 20th century. It provided historical provenance and legitimacy for the Shimazu family, who were once again at the forefront of international relations despite the dissolution of the daimyo. It also underlined the Shimazu family’s powerful Western connections to the passing Japanese pilgrims. Review – Kimono by John Paris. The Satsuma connection explains a lot. Nicely done. Also, bravo on the inclusion of the word ‘framed’; somebody would be proud.